A weak plan for growing online sales will ultimately lead to further lackluster results. Best Buy (NYSE:BBY) has been struggling to grow its business. In a competitive retail industry that's been further complicated by the advent of e-commerce, the company is stuck between its traditional brick-and-mortar store-front model and online sales. For a more in-depth look at this, read my last article on Best Buy first. 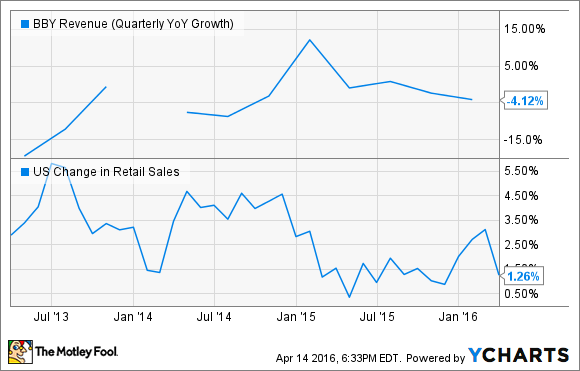 Adding a little more color to the problem is that Best Buy has just been keeping up with U.S. Internet retail growth. Over the past few years, online sales have been increasing by about 14% each year, and projections are that rate will continue at about 11% to 14% through the end of the decade. It would seem that Best Buy's e-retail growth has just been incidental to the overall trend, rather than being attributed to any meaningful marketing push to funnel traffic to the online store. What exactly has the company been doing to enhance online sales? During the last earnings call, CEO Hubert Joly mentioned a few initiatives the company has recently put in place to help the online segment. Specifically mentioned were Blue Assist, Touch ID login, and the Geek Squad app. Let's look at each of these. Blue Assist: Available on the Best Buy mobile app, this feature allows shoppers to simply shake their device or push a button to get live help via chat, or request an email or callback response. Users of the app can now get answers to their questions about potential purchases without leaving Best Buy's online marketplace. Touch ID login: This mobile app feature allows iPhone and iPad users the ability to log in to their Best Buy account using their fingerprint. Who wants to hassle with a username and password, anyway? Geek Squad app: This new release allows users to access their techie help friends without going into a store, at least not right away. Scheduling an appointment, checking on a repair status, or checking Geek Squad coverage are the usability limits here. Same-day delivery: Best Buy announced a pilot program in 13 U.S. cities to offer same-day delivery of purchases that are available in the store. Average shipping costs will be between $10 and $20, and orders must be placed by 3 p.m. local time to be fulfilled. The last earnings release for the fourth quarter of 2015 was an opportunity for Best Buy to outline not just the last year, but also the one to come. A single paragraph dedicated to the online store segment and only mentioning these initiatives tells me that management doesn't see online sales as being a focus for the next year. My feeling on these mobile applications is that they serve current users and customers of Best Buy, rather than drive traffic to the online store or attract new customers. Functionality of the new features and app are designed to increase usability rather than to advertise to or attract shoppers. While getting return customers is important, Best Buy is potentially missing out on a huge opportunity here. The company does have significant reach and scale (it's the largest retailer by total sales operating in electronics and is the 11th largest retailer in the U.S. overall) and no doubt sees retail spending trending ever more toward the Internet, but it opts to continue investing heavily in its traditional business. The same-day delivery pilot program is a positive sign, but it's way behind the curve. as Amazon has offered this option for years already. The company claims that 70% of Americans live within 15 minutes of a store. If this is true, why not start this service a long time ago? In summation, I believe these new online initiatives are doomed to failure, at least from a business growth point of view. The same-day delivery takes aim at playing catch-up, but while it's still in test mode it's hard to say what it could do for the company's growth going forward. Management seems to agree, as Joly predicted flat revenue at best for the coming year. I believe growth investors should look elsewhere at this juncture.